Hi, I'm Adrian Willoughby - welcome to my website. Its name is a reference to Luigi Galvani's research in the second half of the 18th century into what he called 'animal electricity.' Galvani conducted a number of experiments on frogs (or, more accurately, frogs' legs with their crural nerve exposed) designed to demonstrate that electricity could be generated by animals. These proved to be instrumental in establishing the field of electrophysiology. 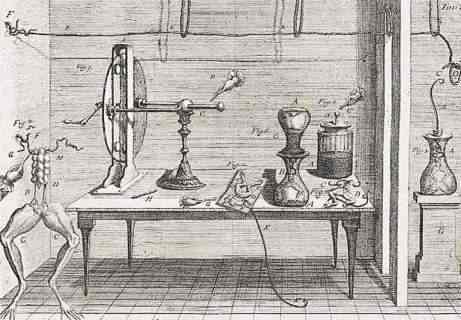 An illustration depicting some of Galvani's laboratory equipment. From "De viribus electricitatis in motu musculari commentarius" (1791). Galvani's experiments and those of Alessandro Volta, who championed an alternative theory of contact electricity are chronicled in 'The Ambiguous Frog: The Galvani-Volta Controversy on Animal Electricity' written by Marcello Pera (a prominent Italian philosopher turned politician). Furthermore, Pera uses this debate to discuss the nature of the scientific method and what factors really influence the success or failure of scientific theories. Galvani's experiments and the climate surrounding newly discovered electrical phenomena also had a profound affect on contemporary society and culture. 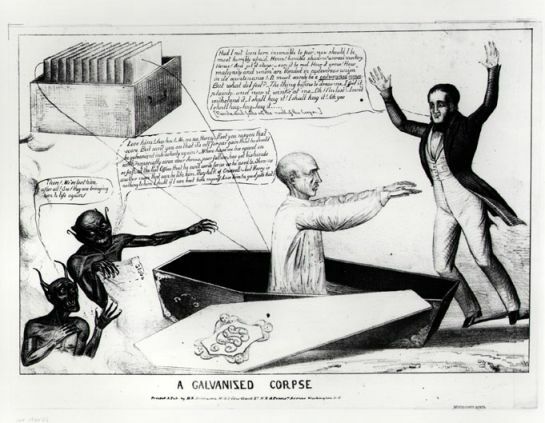 Experiments such as Galvani's inspired a young Mary Shelley to write 'Frankenstein; or, The Modern Prometheus' in 1818. Political satirists at work with Galvanism in 1836.